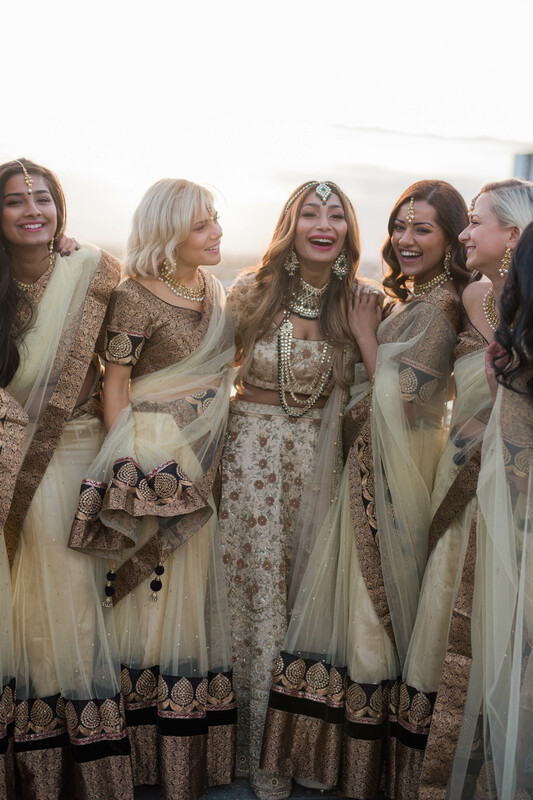 Multicultural or interfaith weddings are inspirational for so many reasons. 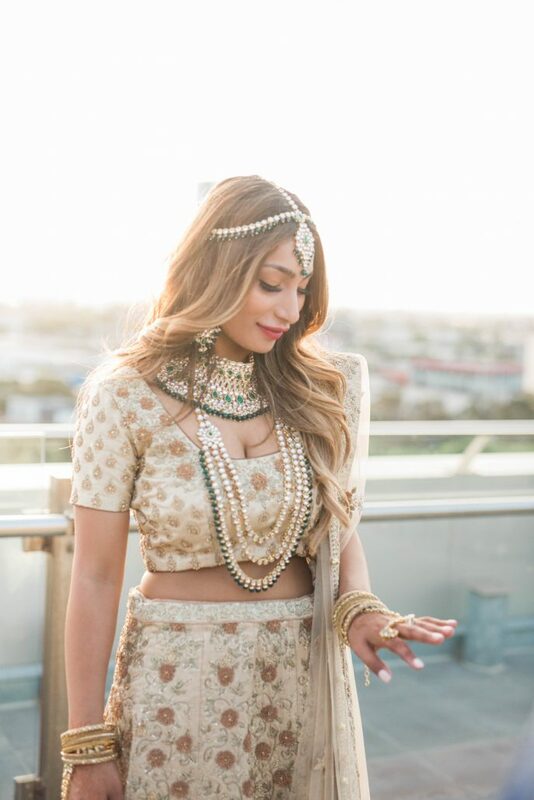 Today’s wedding shows how when combining tradition and style, you can create something classy and beautiful. 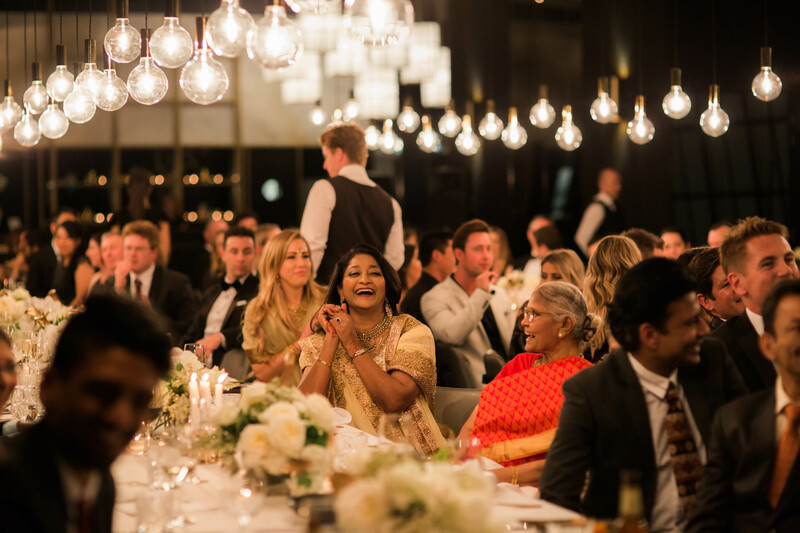 We’re so thrilled to be sharing Priyanka and Max’s stunning Melbourne wedding ceremony and reception party. 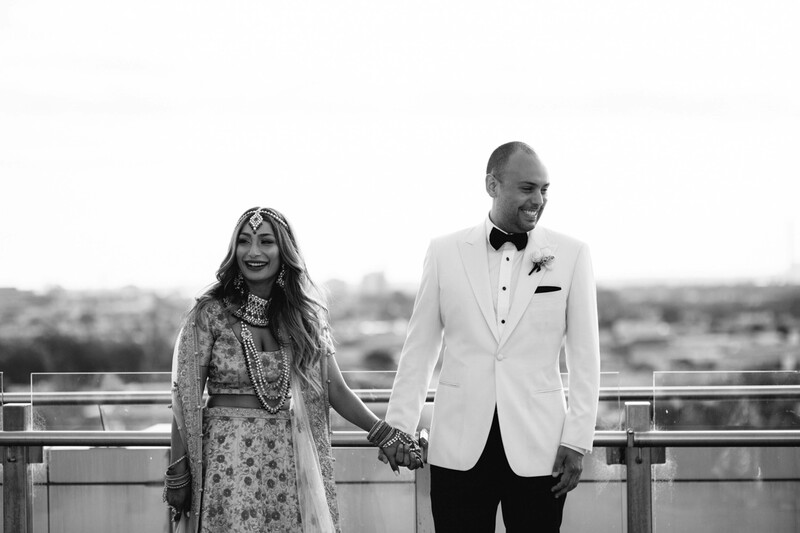 Not only has it got us in the mood for long summer days and nights, but we are also swooning over all the beautiful details from the Melbourne couple’s urban civil wedding. 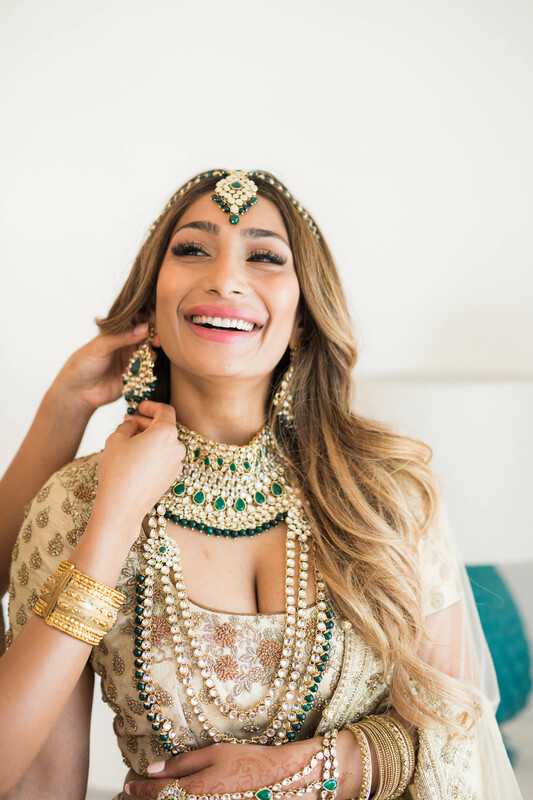 Of course Priyanka’s dreamy Sabyasachi inspired bridal look also has us loving every aspect of this wedding! 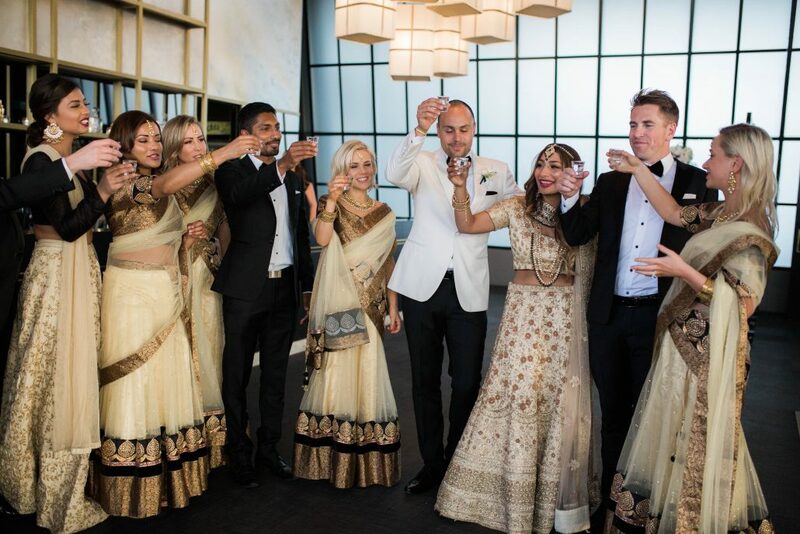 After a total of 3 traditional pre-wedding functions, Priyanka and Max sealed the deal and exchanged vows in one of the hippest parts of Melbourne, South Melbourne, at the stunning Luminare. 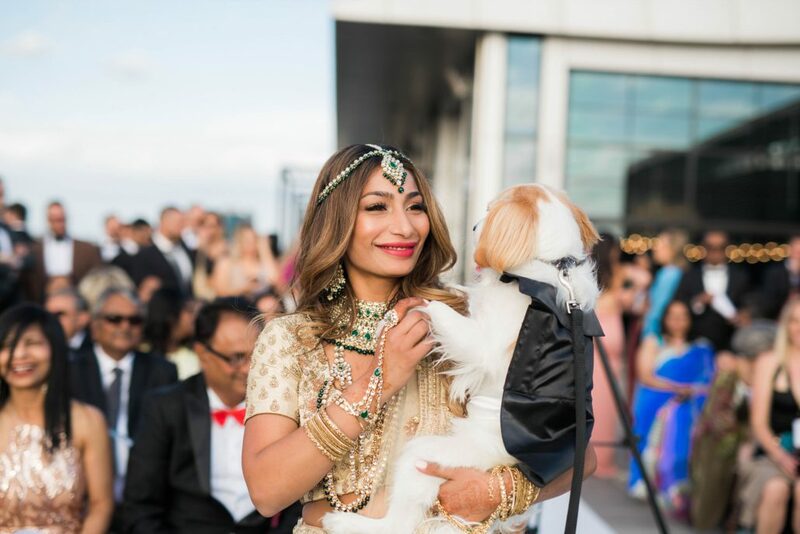 We loved how Priyanka and Max met at an AFL grand final party. I mean where else would you be on one of the biggest events on Melbourne’s sporting event calendar right? 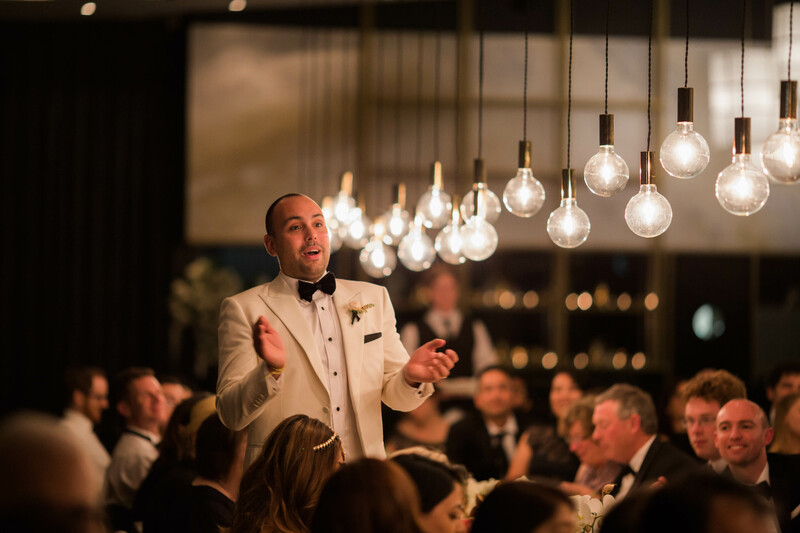 They were introduced by a mutual friend and very soon after dating, Max popped the question in the very classy, Aria restaurant in Sydney. 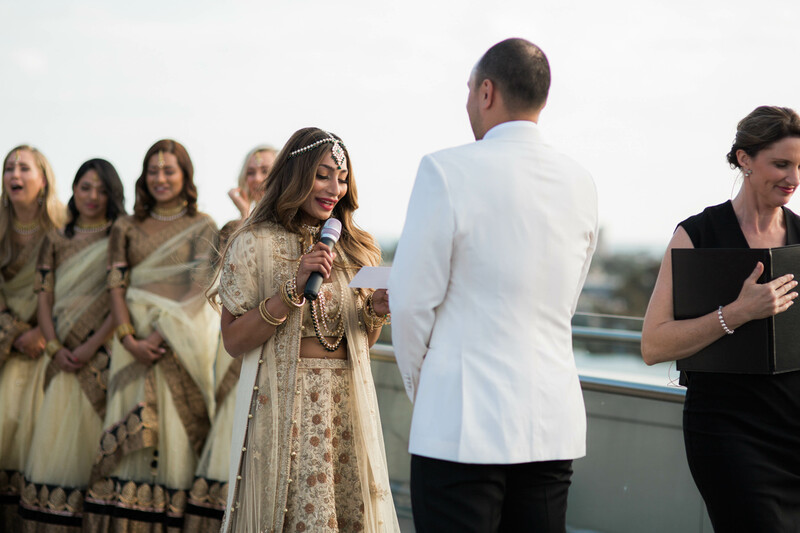 Priyanka explained that it was quite unexpected. I am quite an inquisitive person and I suspected that Max would propose when we went on a holiday to Japan. He did however quickly catch on to my plans. He suggested a trip to Sydney to meet his new boss. So, I booked a nice dinner at Aria restaurant on the first night and that’s where he proposed to me. Max mentioned that he had planned a different proposal but ultimately this was the best way to catch me off guard and surprise me and honestly I had no idea that it was coming that weekend! 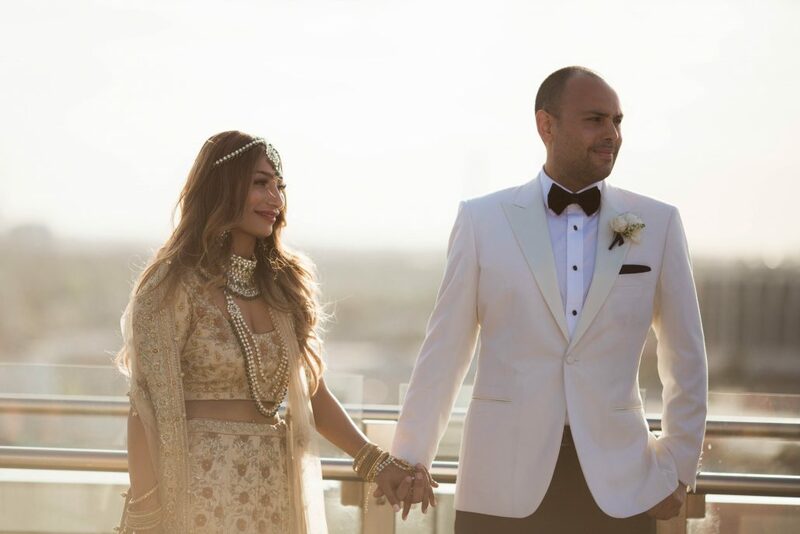 Priyanka and Max exchanged vows in a modern urban setting in Melbourne on a perfect Spring day. 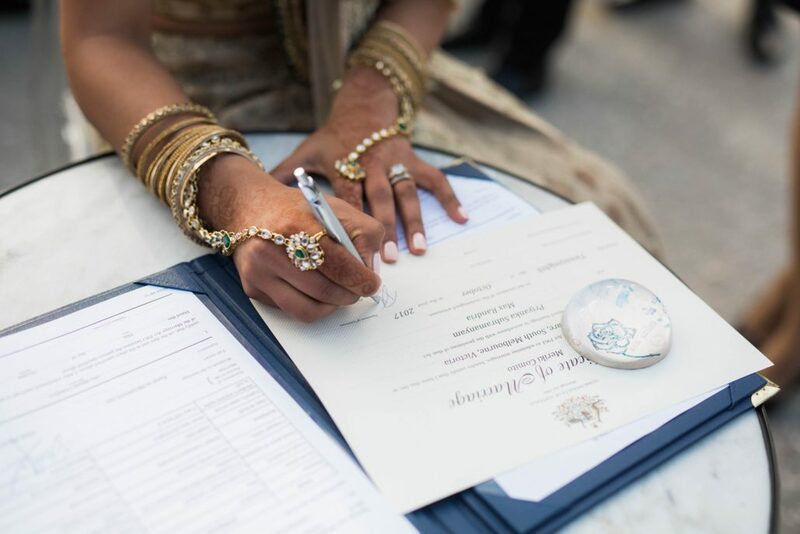 The couple chose to have a Spring wedding purely for the reason that it wouldn’t be too hot or cold. Just the right balance and thankfully for them it turned out to be true on the day. 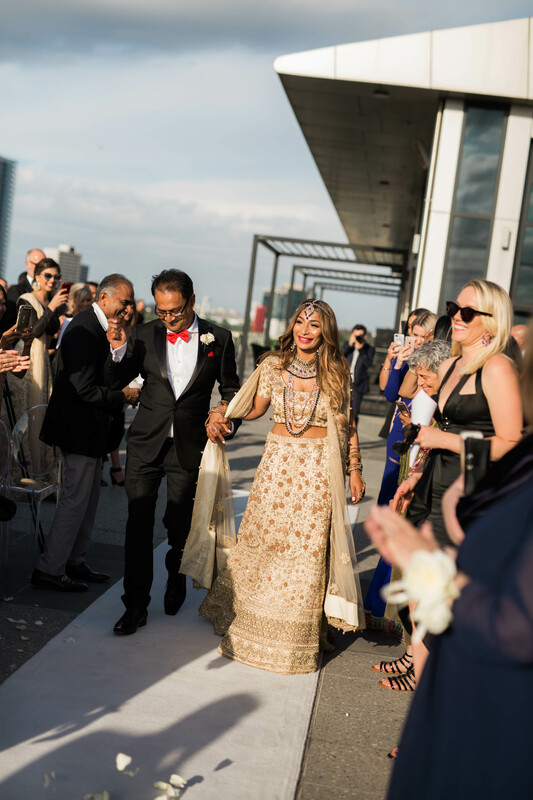 The elegant and stylish rooftop location of Luminare provided the perfect backdrop for this urban couple’s wedding. 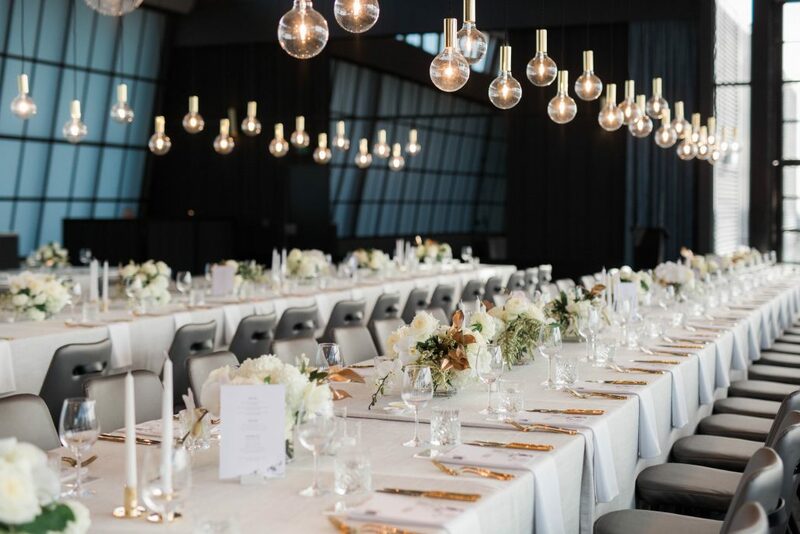 It was the breathtaking views of Melbourne’s city skyline that prompted them to choose this particular venue. 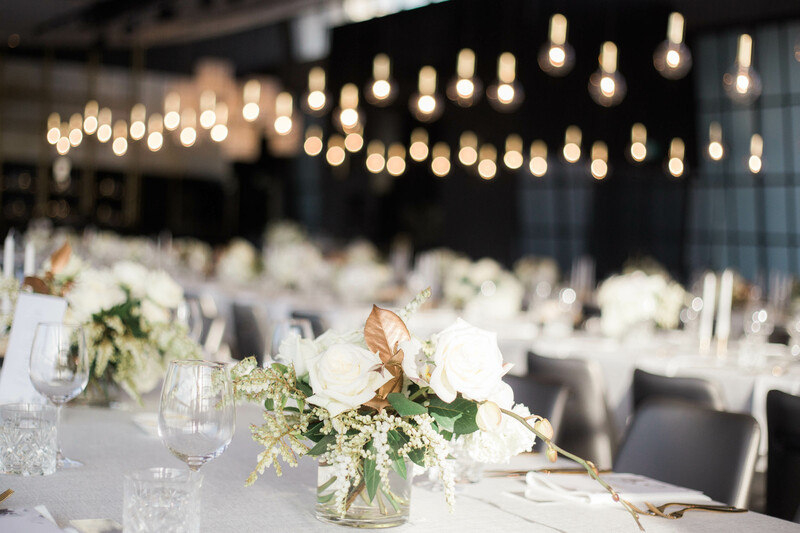 The couple enlisted the help of Steph from Eventurer to style the venue. 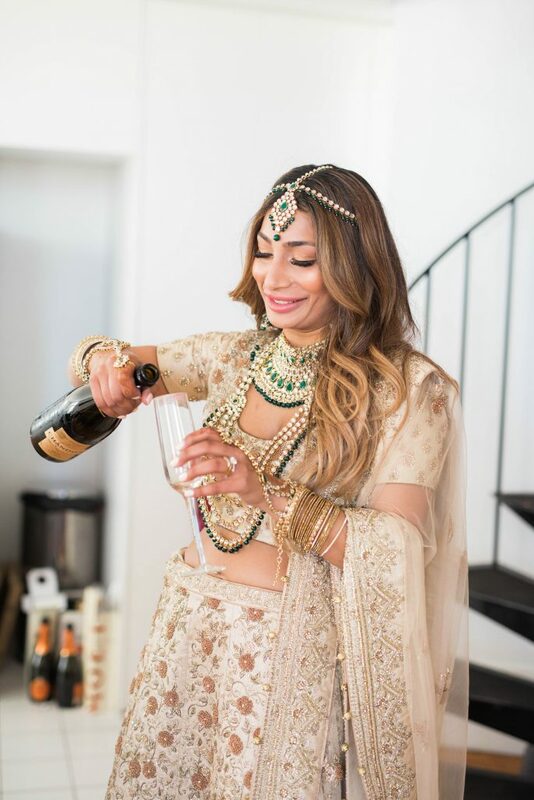 Priyanka was quite chilled out, but explained that everything had to look pretty and organised. Steph from Eventurer assisted Priyanka to help develop a colour palette and design through Pinterest. 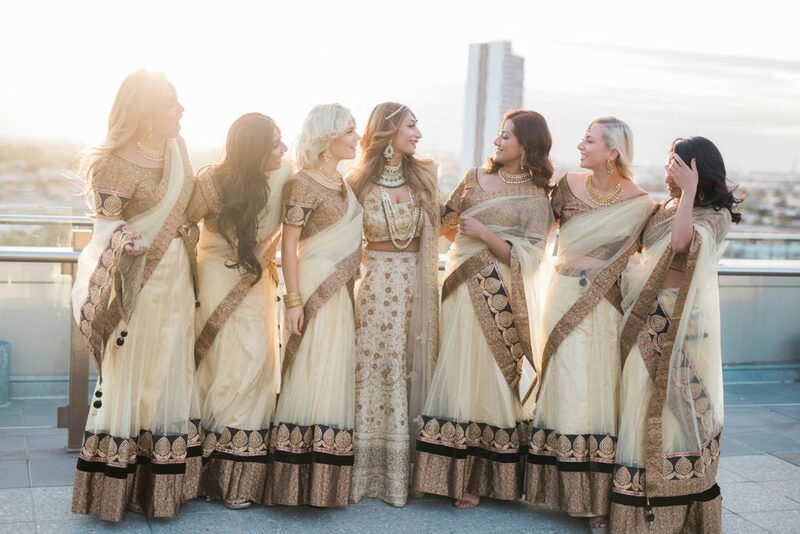 For Priyanka, it was important that her look was traditional and the same applied to her bridesmaids too. 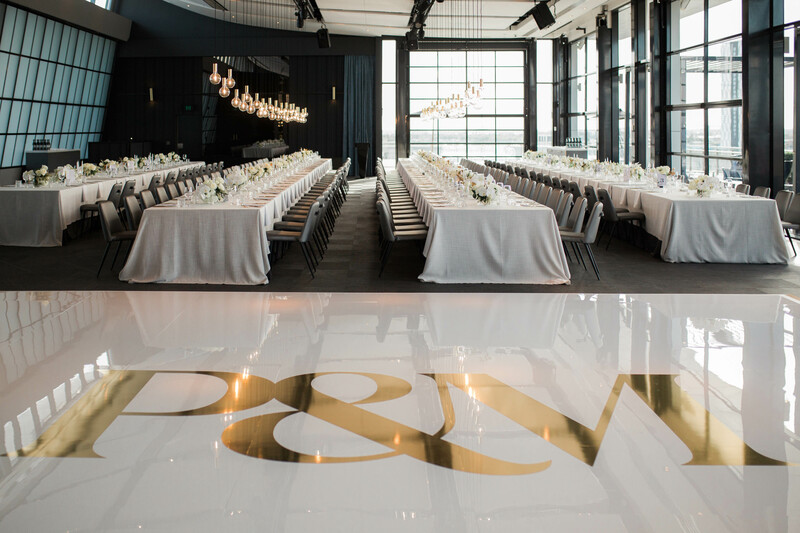 “I wanted the look of the day to incorporate whites, golds, black and greens, making it luxurious and effortless. 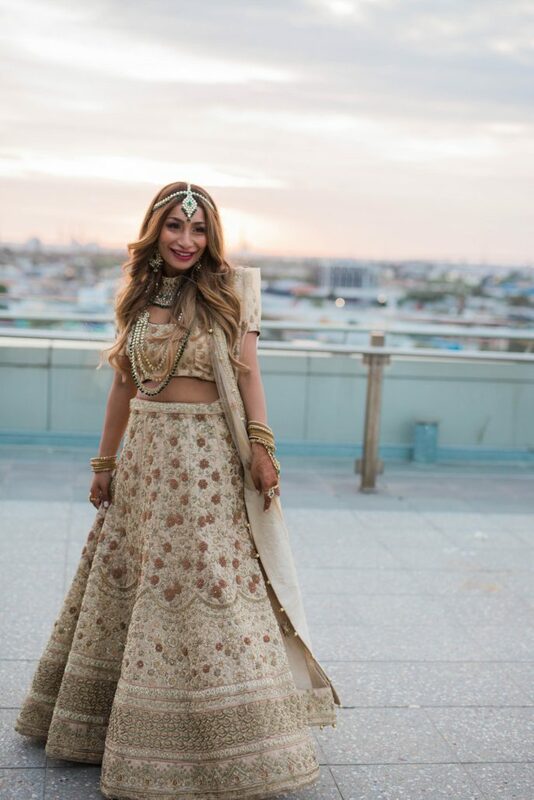 I also wanted to represent my culture for the civil wedding and hence decided to wear a lehenga which I bought from the famous Chandni Chowk in India. My aunt Uma purchased my jewellery from Lajpat Nagar. 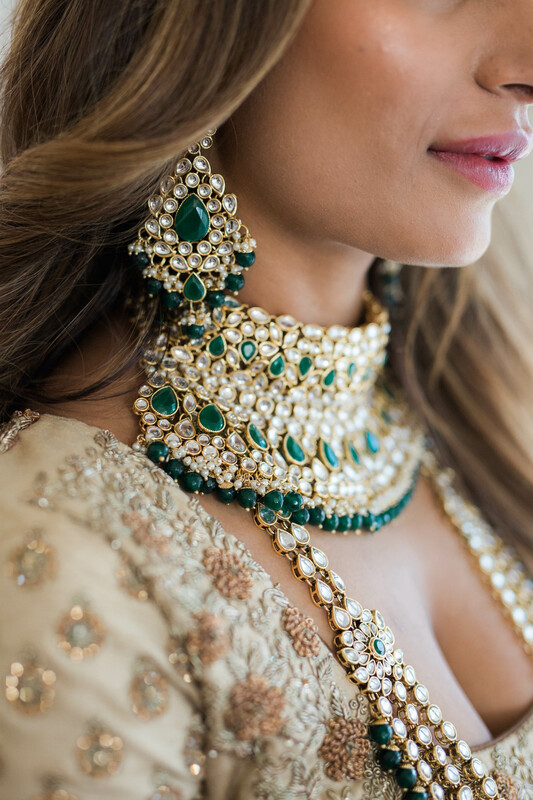 Maestro bridal designer, Sabyasachi, was the driving inspiration behind Priyanka’s beautiful bridal look. 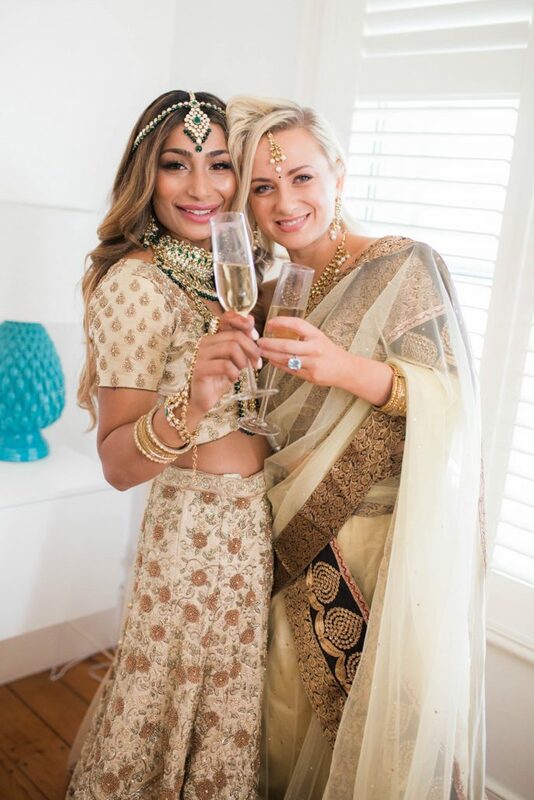 Priyanka relished the moments she shared with her friends and family on her wedding day. 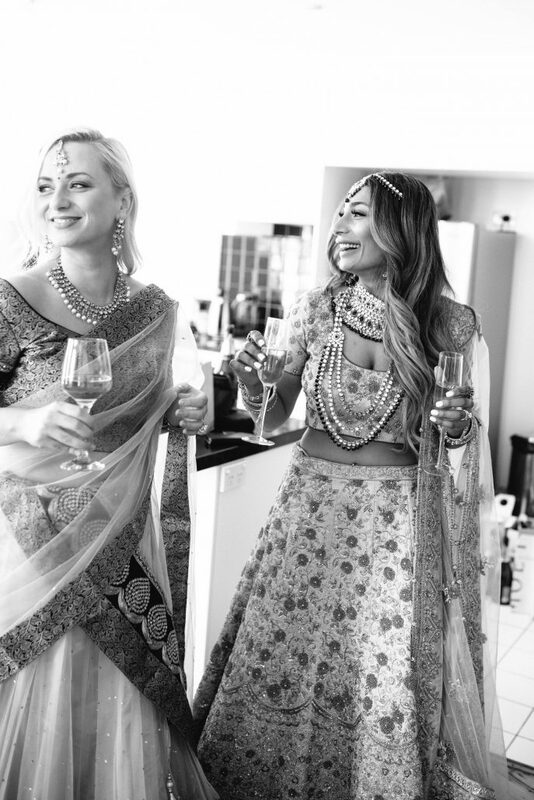 Family had come from near and afar to celebrate pre-wedding celebrations such as the sangeet and Indian wedding ceremony in the lead up to the civil wedding. Some of her closest and longstanding friends were so grateful for having the chance to stand by her side. 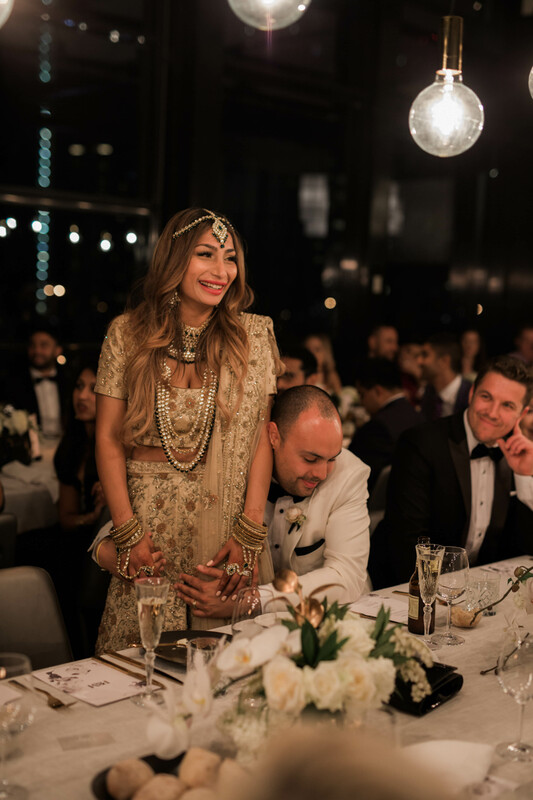 A special mention goes to her hubby, Max who made a touching and emotional speech that captured everybody’s hearts. 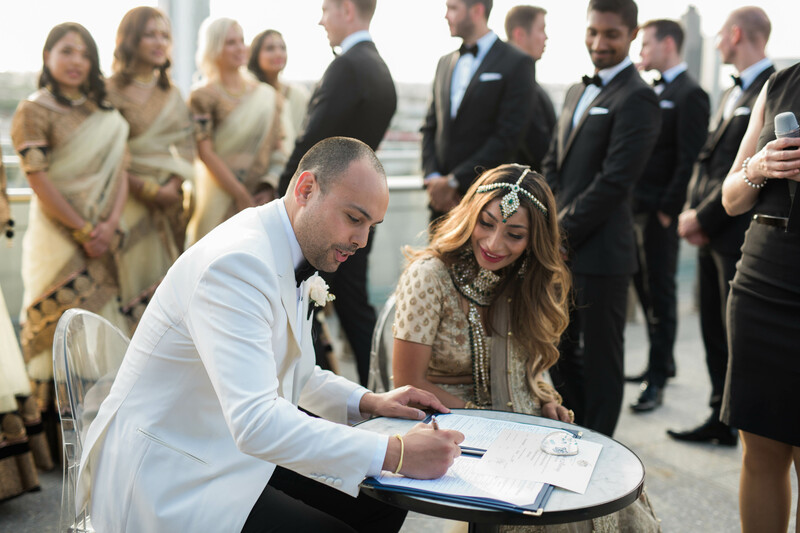 Priyanka and Max’s advice to couples was to trust the services of a wedding planner or stylist. 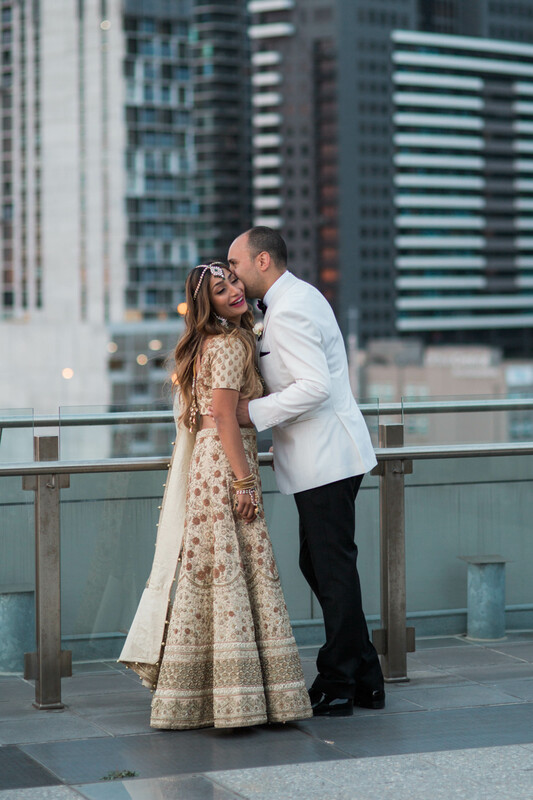 The couple are headed off to the Amalfi Coast soon for their honeymoon just in time for a European summer and to enjoy the delectable Italian cuisine. 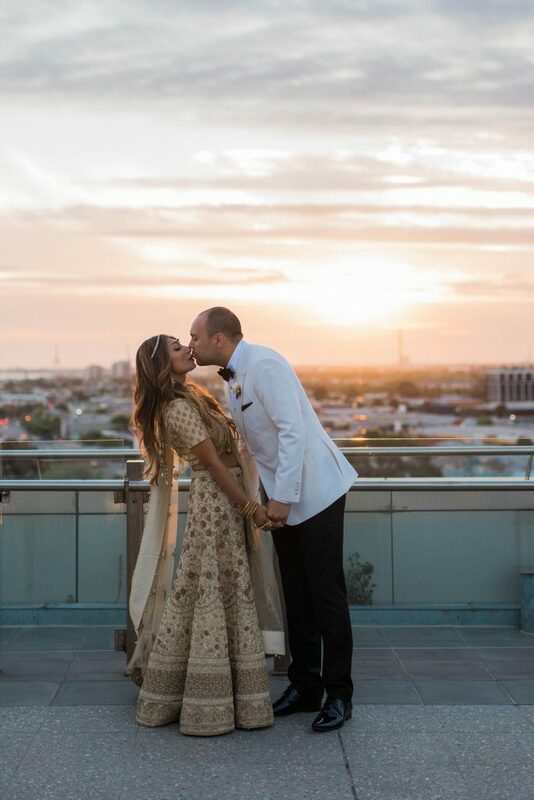 Thank you so much for sharing your beautiful wedding with us Priyanka and Max. 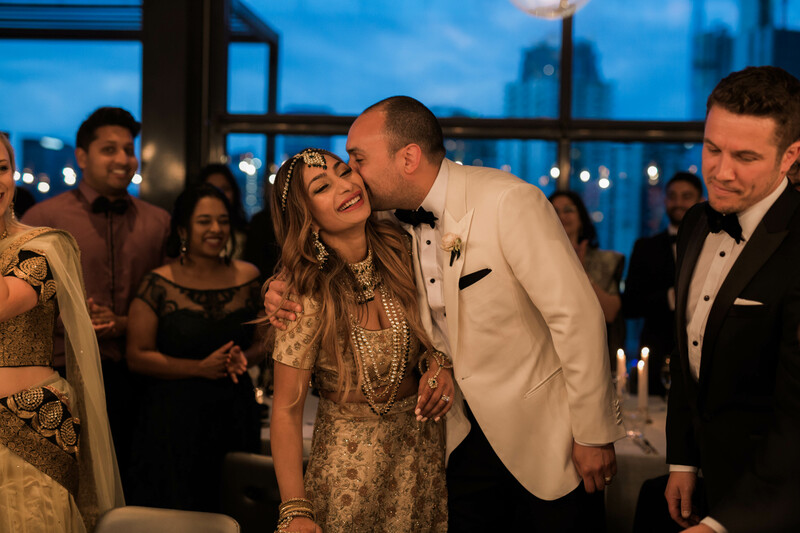 We hope you have a fabulous honeymoon and best wishes!